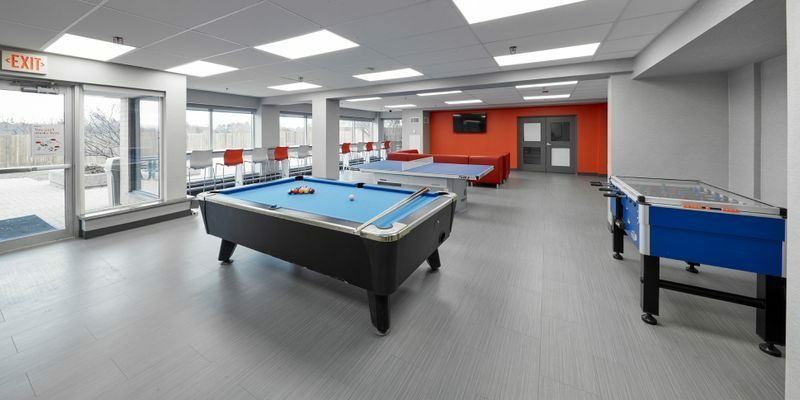 Residence & Conference Centre – King City provides 24 hour front desk services, convenience store, restaurant, common kitchen area, and lounges. . Parking and laundry facilities are available on-site for a small fee. Affordable on-site meeting space is also available for rental – please contact our sales office to check availability and rates. Located on each floor, our lounges are a great option for break out rooms or hospitality suites. These rooms can be set up as a conference room, or pop in a movie and put up your feet in our 24-seat movie lounge. Laundry facilities are available for use for a small fee. A common kitchen area is accessible on the main floor with full size stoves and ovens. Enjoy the use of our barbeques and patio area to cook your dinner, have a picnic, or just relax and enjoy the sun. If the weather is bad outside, guests can use our common dining area to serve and enjoy their meals.